About 20,000 armoured vehicles today. Before the great political divide, there was one Korea, a country with a proud, rich and ancient past, going back to the Gojoseon semi-mythic dynasty in 2333 bc. The small peninsula struggled to survive and was sometimes occupied by its powerful Chinese and Japanese neighbors. It also gained stunning victory and mastered advanced technologies like armored battleships (the Geobukseon or “turtle-ships”) and multiple-rocket launchers in the 1600s. In 1910, the Japan-Korea Annexation Treaty already recognized a military occupation. Until the defeat of Japan, the country inhabitants and culture suffered under a harsh occupation (which later led to war crime judgments). After 1945 and the evacuation of the last Japanese settlers from the country, there were already strong political tensions following the recently gained independence of the country. Part of the resistance against the Japanese, mostly in the North, has been supported by the USSR. The country itself was liberated by Soviet Troops in the summer of 1945 (part of the Manchurian campaign), but the United Nations developed a trusteeship administration and the country was divided among the 38th parallel. The South Korea was under the responsibility of the USA. Both zones led to the creation of a sovereign state, modeled after both sides ideologies, and after 1948 tensions grew steadily. In June 1950 the cold war gets hot. North Korea invaded the South. Its army was mostly equipped with ww2 era Soviet weaponry and tanks. The offensive was swift and brutal, and US support was limited at first. The South Koreans lacked suitable tanks and were also outnumbered. At the same time, the UN denounced the aggression and passed a resolution intended to repel it. In August 1950, however, it seemed the whole South Korean Army would crumble under the North Korean offensive. Under the UN coalition led by General Mac Arthur, a major diversion was planned to attack the flanks of the NK army and turned as a major amphibious landing at Incheon. As audacious as it was, the plan worked wonders and completely redrawn the map. Fearing to be cut out from the rear and surrounded, many of the best NK elements retreated and were even routed. The combined American and SK armies then went on the chase and basically led a counter-offensive straight to Pyongyang in the North. The real surprise came in the winter of 1950 when the Chinese, bound to help this fellow communist regime went on the offensive with overwhelming forces and crossed the Yalu river. US forces that tasted victory were abruptly found powerless to stop the onslaught and many units were comprehensively destroyed, pushed back or routed. The U.S. Eighth Army began its longest retreat for any US army in history. However, after a resolute defense on the 38th parallel in mid-1951, the war entered its third phase, mostly a war of attrition. Peace negotiations started right away but dragged on, as both sides attempted to redraw the map in last-ditch offensives. These battles saw mostly T-34-85s on the NK and Chinese sides, and M24 Chaffee, M4A3E8 Shermans, then M26 Pershing and M46 Pattons on the American side, with the British forces committing their Centurion tanks for the first time with great successes. The latter part (mid-1951 to November 1954) of the war was held on a mountainous terrain and mostly saw infantry and artillery in action. 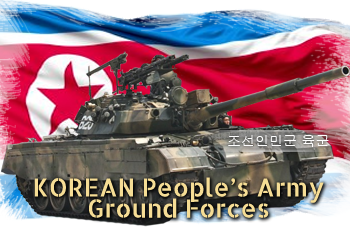 The KPAGF or Korean People’s Army Ground Force was founded on August 20, 1947. It was armed, supplied and trained by the USSR, especially after 1947. By June 1950, this force, led by Choe Yong-gon, outnumbered and outgunned the South Korean Army, committing no less than 300,000 men within the II and V Corps, the 105th Armored Division, the 1st, 2nd, 3rd, 4th, 5th, 6th, 7th, 8th, 9th, 10th, 12th, 19th, and 43rd Infantry Divisions. As it is shown, this was largely an infantry army, but an estimated 600 tanks were in service back then, active into the 105th AD, and spread into the various IDs for support. From this total, the immense majority reported were T-34-85s. Afte the war, the military service stayed quite high in proportion compared to other civilian services. By 1960 the ground forces had an estimated 400,000 active and mobilizable, and in 1972, about 500,000, but by 1990 it had grown to one million, including support personnel (supply, auxiliaries, mechanics, medic..). There was also a significant gap between the two countries in terms of population, South Korea rapidly outgrowing its northern neighbor, helped by a tremendous economic boom in the 1970s and 1980s. By the 1980s, South Korea had gained the advantage both in terms of personal and modern matériel. In return, the Pyongyang regime, still led by Kim Il-sung (which passed out in 1994) encouraged young people to join the military to keep a steadily growing army, at least by numbers. Of course, numbers have a quality in itself according to the traditionalistic military doctrine inherited from the USSR, but the ground forces equipment also led to suspect a state of obsolescence which only reinforced the confidence of the Southern Korean army staff in case of attack. One of the goals of the NK army had always been to repel any attack but also for a very quick offensive (a 2-3 days affair) to the Southern Capital Seoul. The nuclear capabilities which were developed in the late 1980s are only to serve as a backup deterrent in case of such “reunification” offensive, however, there is an arsenal of tactical short-range missiles which could be deployed in such a case. According to the usual scenario, the offensive would commit a large conventional army, largely equipped -a specificity of North Korea- by self-propelled artillery for constant support to the line of fire. North Korea fully supported Iran during the Iran–Iraq War. This had a double objective trade: Iran was the only country then not hostile to NK, which was deprived of oil and gas importations, and in exchange, passed on weapons imported from USSR and China, which were denied to Iran by both superpowers. This deal bolstered Iran forces and helped maintain a relative stalemate, eventually forcing Iraq to retire. The first order was a billion-dollar sale of Chinese equipment from North Korean stocks (with some local T-54/T-55s) in 1981-83. Gradually North Korea served as an intermediary for direct Soviet equipment Sales. 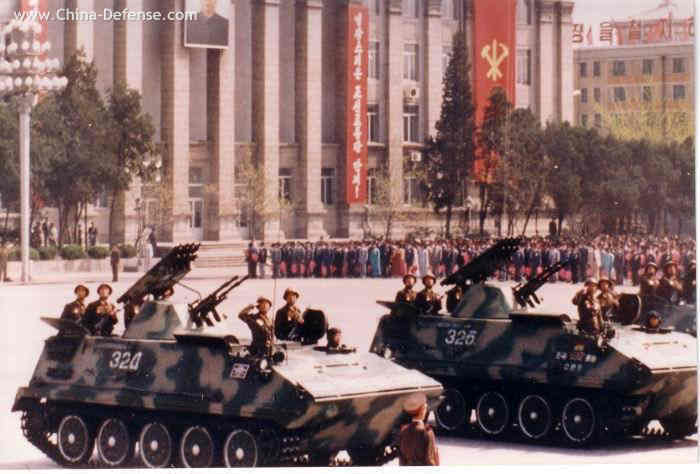 In the mid-1980s China closed its weapons supplies to North Korea, but USSR still relied on North Korea for the supply to Iran of SA-7 old stock surface-to-air missiles. After 1985 Ayatollah Akbar Hashemi Rafsanjani visit, North Korea provided training, consulting and send military advisors. Training of Iranian personnel in the fields of mobile surface-to-air system and unconventional warfare techniques was essential to Iran’s fate in the latter war. 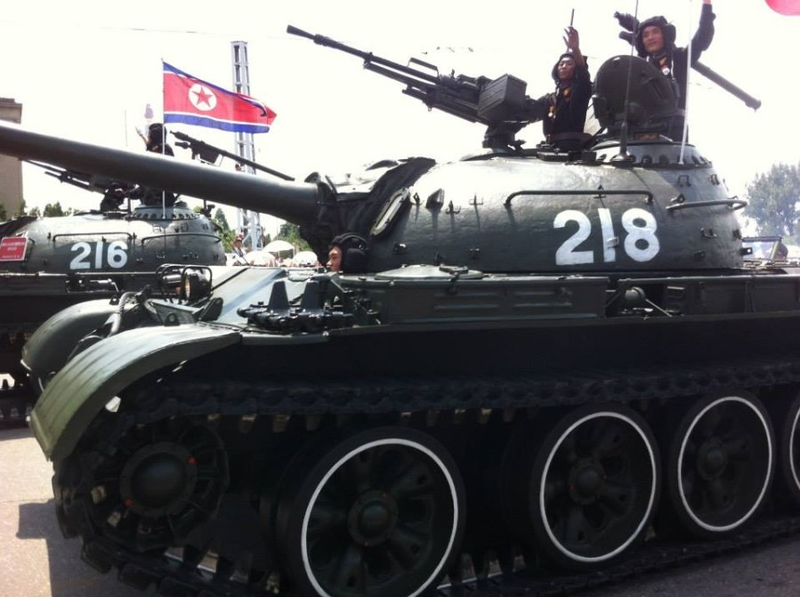 After T-54 and T-55s, North Korea also sold locally-built (over an estimated 600) many T-62 tanks. Apparently more modern T-72s purchased from Libya or Syria were also possibly re-sold. Other sold equipment included small arms from North Korea, Czechoslovakia, the PRC, and Libya (some 12,000 machine guns and rifles and 1000 mortars in total), 400 artillery pieces including many SPGs, a NK specialty, like the Koksan that had the longest range at that time in the world and helped secured efficient strikes on Iraqi assets. The deal also included sales of ATGMs, CSS-C-2 Silkworm ASMs, 600 anti-aircraft artillery pieces and SPAAGs like the ZSU-57-2, MANPADS or SA-7 shoulder-fired surface-to-air missiles and surface to air missiles like the infamous SCUDs. Since the breakdown of relationships between China and the USSR in the early 1960s, North Korea definitively entered the sphere of influence of China and still is. 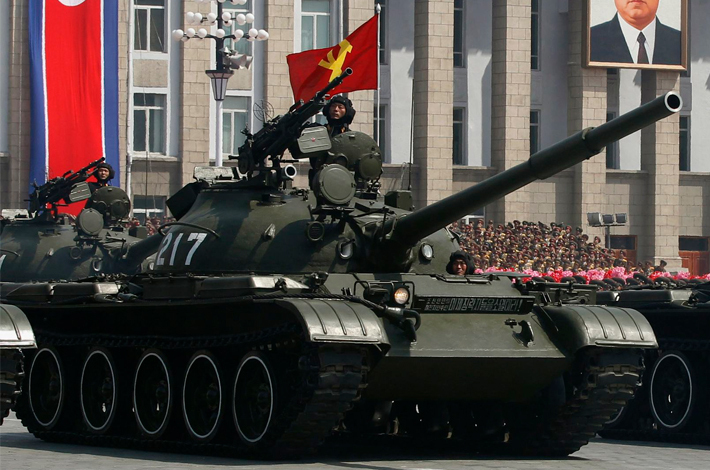 Just like China, North Korea had to deal with obsolete Soviet technology (and was cut out from Soviet advances in this field) and had modernized its own fleet of tanks in the 1980s. But contrary to China it did not have the option to gain access to Western technology due to its seclusion. By then at least three types were known in service: The T-54/55, the T-62, and the T-72 (after 1990). Acutely aware of their technological backwardness the Army staff decided to devise a national doctrine, the Juche-po or “self-sufficiency” policy, which traduced into various measures to modernize and recycle the available matériel. It is also the name of the most current SPG in the NK arsenal today. The T-54/55 were modernized to some extent, as well as the T-62 that were derived into the Chonma-Ho (1981) and around 200 T-72 were obtained at scrap metal value after the dissolution of the USSR, and then modernized in several batches as the Popkung-Ho (1992). The latter are now considered only for the elite guard units, while the fi (around 1200 in various stage of modernization) are kept for the best frontline units. 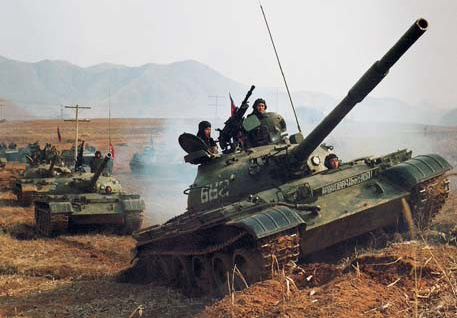 The large array of obsolete T-34/85 was re-used as self propelled artillery, SPAAGs, ARVs, bridgeayers and mine-clearers in the 1970s, and so were the T-54/55 in the 1980-1990s. The Juche-Po generic series of SPGs counts perhaps seven different types. Around 2000 Type 59s were also acquired from China. Some were seen in action with the Iraqi Army in 1990s. The army also counts a light amphibious reconnaissance tank of national construction, the PT-85, but also at least two APC types, the M1992 and VTT-323. 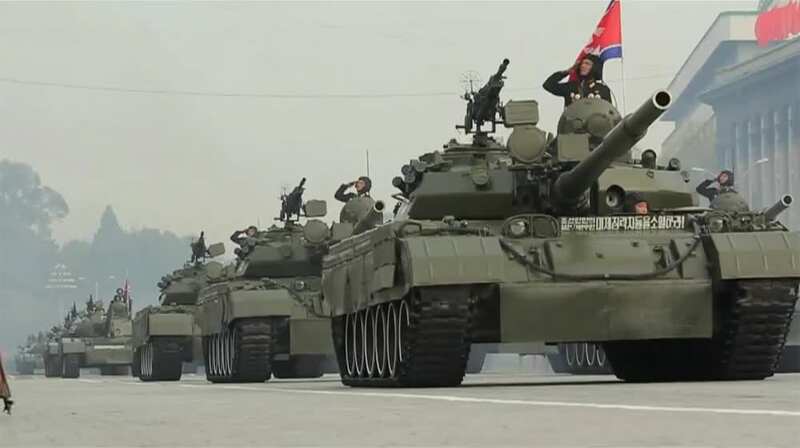 According to the US Department of defence official reports, in 2014 the North Korean Ground Forces strength is 950,000 personnel, 4,200 tanks, 2,200 armoured vehicles (mostly APCs), and 8,600 artillery guns, plus 4,800 multiple rocket launchers. This total is 19,800 armoured vehicles. 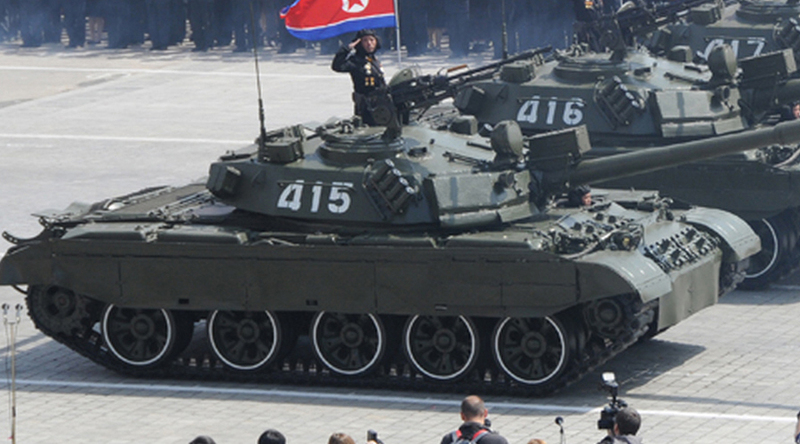 The first North Korean tanks were upgraded T-34/76 Obr. 1943 delivered by the USSR. However nearly all T-34s photographed in the Korean war were T-34/85 (the long barrel version), but at least one painting and several photo shows older T-34/76s. A full brigade (about 120 T-34-85s) spearheaded the invasion of South Korea. Many more were spotted in action, mostly in infantry support. They were unstoppable at first and destroyed Task Force Smith, largely equipped with U.S. M24 Chaffee light tanks, proving immune to bazookas. Its only match then was the M4A3E8. After Inchon when US Forces had a full air naval support and M26 heavy tanks, it largely reverse and most NK T-34 were lost during the second phase of the war until the winter of 1950. The Chinese PLA intervened also with T-34/85s but they were largely used for infantry support. It is not known of some were passed on to the North Koreans during of after the war. A report stated that 97 T-34-85 were knocked out and another 18 probable. Due to their fighting value, the tanks made the core of the KPAGF until 1967 when the first T-54/55 arrived in service. They still accounted for perhaps 60% of the MBT total in the early 1970s, but by the 1980s figures are more ellusive. 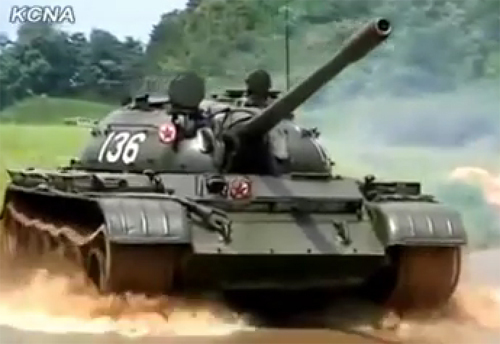 A 2012 footage shows a T-34/85 either used for a film reconstitution of the Korean war of training (reserve armoured training regiments), but the technological gap is so immense with more recent MBTs that its only value could have been for driving training. There is no viable estimation of the numbers of T-34s in storage now, but at least since 2009 they are never shown in parades. About 400 T-54s and 250 T-55s were ordered in 1966 from the Soviet Union, delivered in 1967-1970. 300 more T-54s were delivered in 1969-1974 and possibly assembled in North Korea. 50 T-55s were delivered 1972-1973. 500 more T-55s were delivered in 1975-1979 and a last batch of 19 T-55s were delivered in 1992 (through Belarus). As of the year 2000, around 1,600 T-54s were estimated in service. More than 3,500 combined with T-55s, Type 59s, and ChonMa-Ho were estimated in service by 2006 (wikipedia). 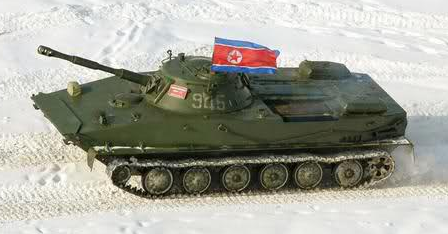 Main battle tank of North Korea today. Around 1200 are given to frontline armoured divisions. Based on a possibly Syrian T-62D, reverse-engineered in the 1980s. It was upgraded in several batch, the latest being apparently the sixth. These variants are western conventions based on visual observations and the few scarce elements available by intelligence. The latest is probably on the level of a T-62M. The basic hull was also used for an ARV, a command tank, and several SPGs. Reverse-engineered T-72 (possibly ex-Iraqi, passed on by Iran), but later upgraded with T-80 and T-90 technologies. This MBT is only given to the 105th Seoul Ry-Kyong-Su Guards Division (around 200 as of 2010). Four variants are known. Main armament 125 mm 2A26/46, AT Spandrel ATGMs and SA-7/16 MANPADS in addition to the AA heavy MG and coaxial 7.62 mm. The only known specialized Light tank of North Korean design and construction. Amphibious and probably mixing influences of the PT-76 (in service with the North Korean army) and of the Chinese Type 63 light tank. It is based on a lengthened VTT-323 APC. Main APC of the North Korean Army. Licensed copy of the Chinese YW531 Armored Personnel Carrier. They have for some the Susong-Po (AT-3 Sagger variant) ATGMS and SA-7/16 man-portable SAMs. No production records. Amphibious APC of domestic design and construction influenced by the Soviet BRDM-2 design. Equipped with the Soviet AGS-17 40-mm grenade launcher, and Fagot (AT-4 Spigot) portable ATGM. One variant observed, the 24-tube 107-mm MRL version. No production data available. 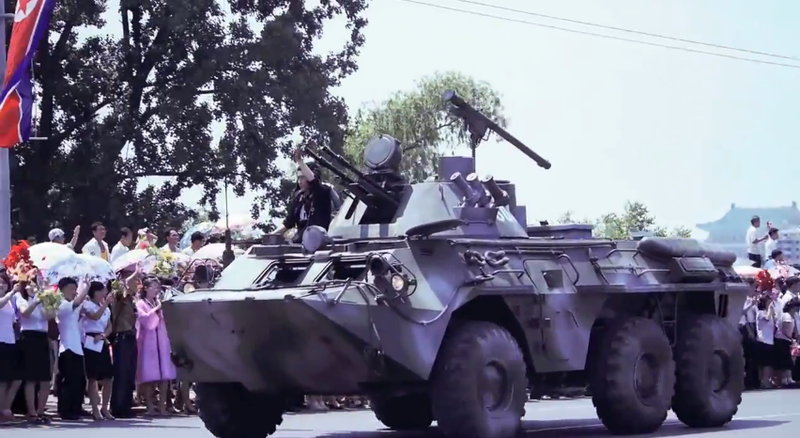 Observed in parades but of unknown denomination are locally-built, BTR-80 inspired vehicles. The most singular of both is the 6×6 version, developed in the early 2000s, and derived probably from the 32 BTR-80A APCs acquired from Ukraine. 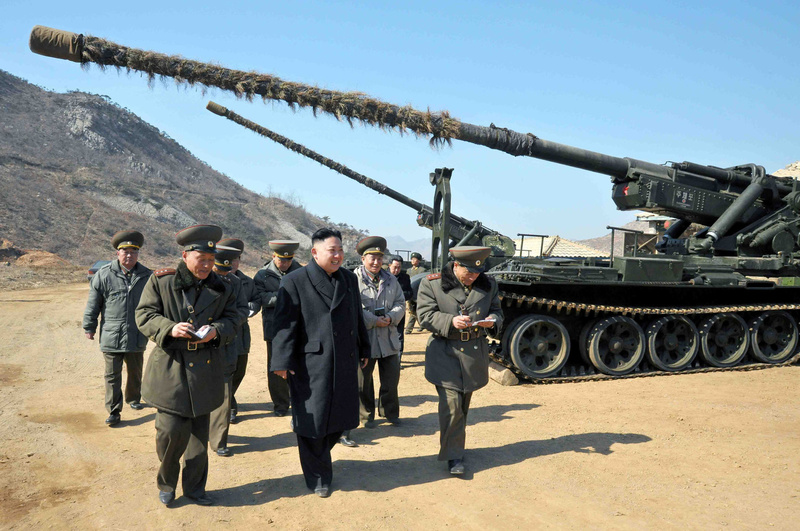 The main armament is a twin 14.5-mm machine guns turret, with the addition of 4 Manpads. It should be noted also that older BTR-60PBs are also in NK service. The 8×8 is sometimes referred to as the M2010 by some experts. it is essentially similar to the 6×6 version. Production details are unknown. Tŏkch’ŏn – ATS-59 tracked tractor based artillery piece (1960s). Illustration of a North Korean T-34/85. Knock-out North Korean T-34/85 near to the Incheon landing zone in september 1950. Wikipedia. Wrecked North Korean T-34/85 shot at the bridge south of Suwon (Korean war). Wikipedia. T-62/Chonma-Ho 1 in manoeuvers (credits irandefence.net). Ch’ŏnma-ho III, camouflaged, in parade. PT-85, current North Korean amphibious tank, armed with a scale-down version of the T-54/55 gun, 84mm, and mix between a PT-76 and VTT-323, which is basically scaled up. Unknown 6×6-8×8 APCs (M2010 ?) derived from the BTR-80/85 in NK service. M1978 Juche-po Kok’san 170 or 180 mm SPG.